A few weeks ago, I was lucky enough to be invited to a Blogger event at The Boutique Spa in West London who are the first high street spa to partner with skincare brand ESPA. Boutique Spa offers a range of other treatments including massages, facials, waxing, threading and even treatments for men. On offer to us Bloggers attending the event was a whole host of treatments from skin assessments, foot massages and pedicures to a manicure. 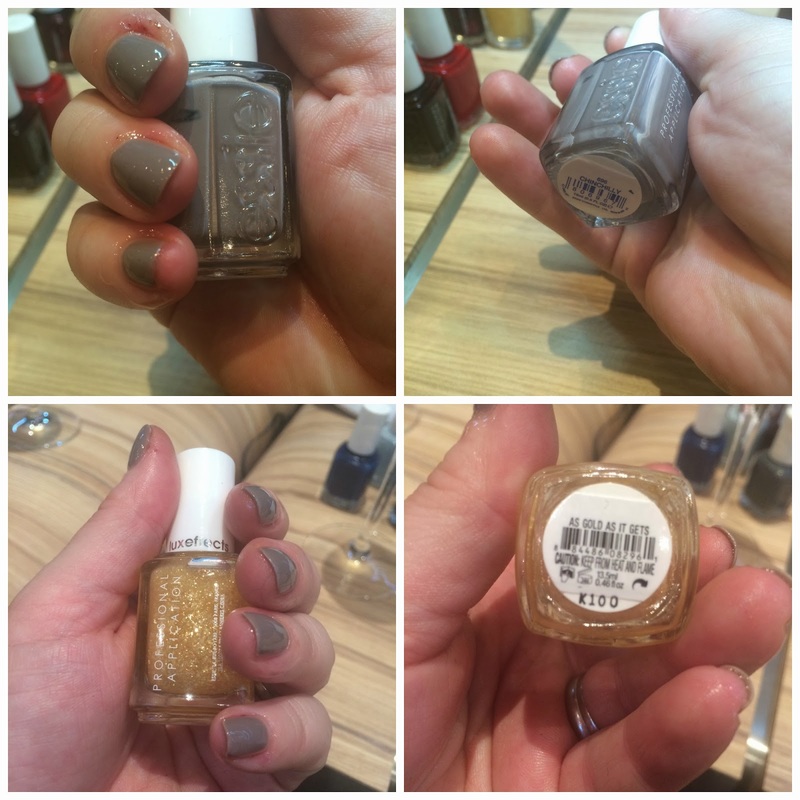 I was also lucky enough be given a glass (or three) of Champagne whilst I relaxed having a hand massage and manicure with the latest releases from the Essie Polishes from their Festive Range. Each manicure starts at £14 and comes with the option of upgrading to a classic manicure which includes a hand and arm massage, or for those wanting The Boutique Spa Manicure this includes a soak, exfoliation, mask, heated hand and arm mits, massage, cuticle tidy, shape and buff/polish starting at £25 for 20 minutes. I was given a choice of colours to choose from for my manicure and whilst I would usually opt for a berry colour or something purple, I went for something totally different and completely out of my comfort zone. The Shade I went for was 'Chinchilly' which is described as being "A delicious smooth light praline nail colour that adds a touch of elegance hands and feet what ever the occasion". I was a little unsure as to whether or not I would like the shade to begin with, but once it was applied I loved it and with an added extra of 'As Gold As It Gets' which is a lovely shimmery top coat, my nails looked fabulous. My nails were also treated with Dadi Oil, which is a 95% Certified Organic Nail Treatment which absorbs quickly and penetrates deeply to enhance flexibility and prevents nail brittleness. This oil smells wonderful of Lavender and Bergamot which are just 2 of the 21 essential oils this product contains. I also couldnt resist this lip balm which comes in the most amazing packaging with a mirror! it smells wonderful and is so nice on my lips, I love it. I really enjoyed attending this event and if you are ever in the area please do go and look them up. 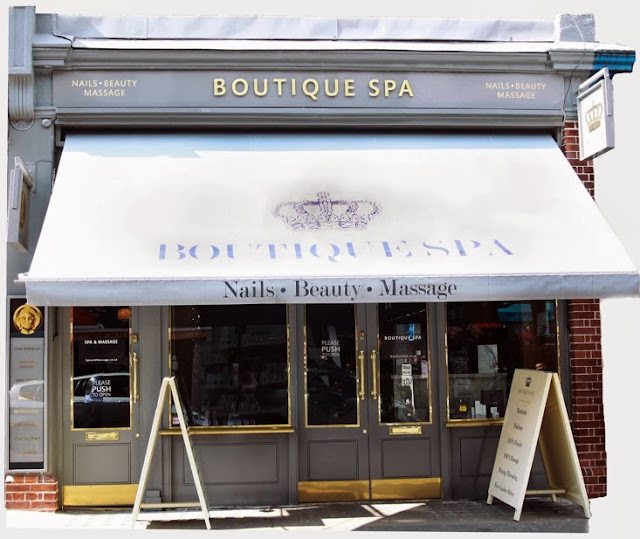 Boutique Spa is located at 123 Queensway, London W2 4SJ and more information can be found on their website HERE. Looks like a well planned event. I loved the 'As Gold As It Gets' top coat. The 'Dadi' Oil is something I would try as my nails are quite brittle. Amazing place, and how many goreous items!! Ohh this looks and sounds amazing - love the goody bag too! Sounds like a great place to go! Might have to give this place a try when im next in london! Looks like you had a great time! I have heard lots of good things about Espa products, but not had a chance to try them. That balm looks lovely!